जीत हासिल करने की योजना और तौर-तरीके अलग-अलग हो सकते हैं, पर वे मूल सिद्धांत, वे नियम जिन पर चलकर कोई इंसान जीत हासिल करता है, सनातन है और हर कोई उन्हें अपनाकर जीत की राह पर आगे बढ़ सकता है। विजेता कौन है? जीत कैसे हासिल की जाय? और मुश्किलों को पार कर आगे कैसे बढा जाय? There are two types of people, who will tell you that you cannot make a difference in this world. Some of them are afraid to try it themselves and some of them are afraid that you will succeed and become a Winner. Persons who go forward in this world are those people who search for their desirable circumstances and if they do not find that circumstances then they make them favorable. A man, as a general rule, owes very little to what he is born with – A man is what he makes himself. 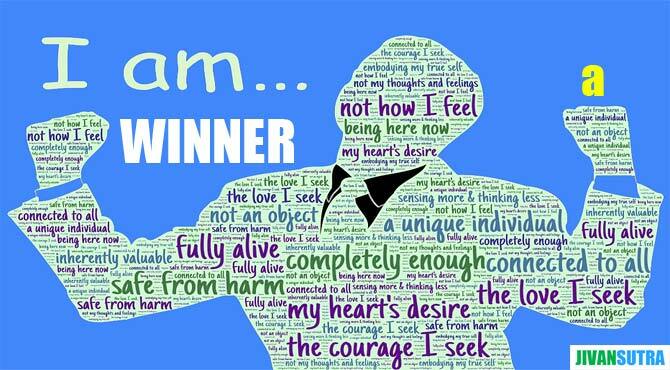 To win oneself is the biggest victory for a real winner. To be a star you must shine your own light, follow your own path and not be afraid of the darkness, for that is when stars shine brightest. The man who have done big things are those who were not afraid to attempt big things, who were not afraid to risk failure in order to gain success. No matter how many mistakes you make or how slow your progress, you are still way ahead of everyone who is not trying. Remember, what you get by reaching your destination is not nearly as important as what you become by reaching your goals – what you will become is the winner you were born to be! याद रखिये, अपनी मंजिल पर पहुँचकर जो आप हासिल करते हैं वह प्रायः उतना महत्वपूर्ण नहीं होता जो आप अपनी मंजिल पाकर बन जाते हैं – जो आप बनेंगे वो वह विजेता है जो आप बनने के लिये पैदा हुए थे! It is easy to have faith in yourself and have discipline when you are a winner; when you are at the top. But it is more remarkable to be endowed with faith and discipline when you are not a winner. If you have the will to win, you have achieved half your success; if you do not, you have achieved half your failure. Winners are those people who refused to leave those opportunities which losers left considering them obstacles. Part of being a winner is knowing when enough is enough. Sometimes you have to give up the fight and walk away, and move on to something that is more productive. When the efforts hurt oneself to get one’s target, then understand that soon you will get the victory. Winner never quits and quitter never wins. In the beginner’s mind there are many possibilities, but in the expert’s mind, there are few. A winner is a person who recognizes his god-gifted talents, works hard to develop them into skills, and uses these skills to accomplish his goals. You can never become a winner in your whole lifetime if you afraid to lose.